The Cleveland Scholastic Play by Play Classic returned to Baldwin-Wallace for the sixth consecutive year on Sunday and the event featured a seven game lineup that brought out everyone from hoops junkies to college coaches. With another year in the books, let's take a look at some of the top performers from the loaded event. Dwayne Cohill (Holy Name) 6'1, 2018 - ESPN's 57th ranked player in the 2018 class, Cohill has grown accustomed to performing on the big stage and in front of collegiate coaches. The junior guard turned in one of his most efficient showings to date as he flirted with a triple double in a 79-57 route over a young but talented Brush group, tallying 30 points, 8 rebounds, and 8 assists. Cohill is as slippery as they come in transition and when he has a full head of steam, look out. Using a variety of eurosteps and stepthroughs, nearly every one of his field goals was a result of an uncontested finish at the rim. I walked away impressed with not only his efficiency, but his awareness and improved basketball IQ as he continues to mature into a lead guard. Yahel Hill (Cleveland Heights) 6'0, 2018 - Hill reached the 30-point mark yet again this season and has been one of the area's breakout players, despite being a three-year starter for Cleveland Heights. At 6'0, Hill isn't going to wow you with his size or strength but against a physical Warren Harding team, he showed an improved toughness and finishing ability around the rim. Not only was he scoring in the paint, but Hill's patented pullup jumper was in full effect and proved to be too much for the Raiders. It was a handful of free-throws down the stretch that sealed the game for Heights and the win pushed Hill and company to number two in our latest Top 25 poll. J'Van Beasley (Shaker Heights) 2017 - While Shaker Heights has been without a few key pieces for a large part of the season, senior J'Van Beasley has emerged as a go to scoring option for Coach Danny Young, he is the team's second leading scorer behind junior Dale Bonner. It was Beasley's hot shooting in the first half that jump started the Raiders offensively and allowed them to hold a 14-point lead at halftime. The Raiders win on Sunday is key moving forward and with Christian Guess set to return in the next few weeks, Beasley is a guy who can make a significant difference moving forward. 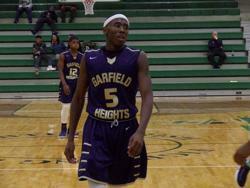 Marreon Jackson (Garfield Heights) 6'0, 2017 - Jackson has been nothing short of sensational this season as he has led Garfield Heights to a 9-2 record early on. The University of Toledo signee is perhaps the most valuable player in the area in terms of what he offers to his own individual program. Against Revere, Jackson did everything from rebounding the basketball to facilitating out of pick-and-roll situations. Not to mention his team-high 26 points. Kyle Goessler (Brunswick) 5'11, 2019 - Goessler was the only non-senior in the starting lineup for Brunswick a year ago on a team that reached the regional semi-finals. The experience has appeared to have paid dividends early on in his sophomore campaign. Goessler scored 27 of his team's 41 points on Sunday and was unconscious from behind the arc in the second half as he would go on to drill six triples. Considering the fact that he missed out on a few good looks early on, Goessler could have easily added a few more to his total. Pete Nance (Revere) 6'8, 2018 - On Sunday, fans in the Cleveland area were able to get their second glimpse of Pete Nance this season and he didn't disappoint them, scoring a game-high 29 points against an athletic Garfield Heights squad. Both Nance and Revere got out to a slow start but it wasn't long before the versatile forward found a rhythm. Able to play inside-out, Nance has an effortless shooting stroke to go along with a soft touch around the bucket but perhaps the most overlooked aspect of his game is his ability to see the floor and make reads out of the high post. He aholds offers from the likes of Akron, Tennessee, and Stony Brook but is garnering interest from high-major programs across the Midwest.